Progressive sci-fi metal innovators VOIVOD continue to promote their latest Mini-CD release entitled “Post Society – EP” and have therefore just announced a next string of live-dates, which will see the band playing festivals and club-shows in Europe throughout June as well as selected dates in their Canadian home afterwards, including an appearance as support to Metallica in Quebec City. “The writing of the new album is nearing completion, but it is already time for us to fresh up the set list for the first leg of our European tour in June. I am especially excited to play Sweden Rock once more. When we played there in 2009 I got to watch UFO performing a stellar set. This time we are sharing the stage with other heroes of mine, Lucifer’s Friend! 22.07. Baie-Saint-Paul / Quebec (Canada) – Le Festif! 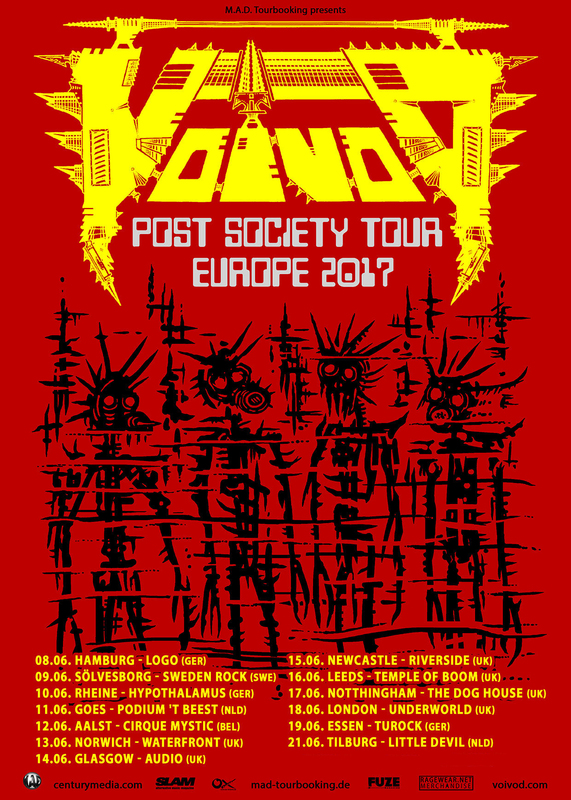 VOIVOD 2017 are Snake – Vocals, Chewy – Guitar, Rocky – Bass and Away – Drums.